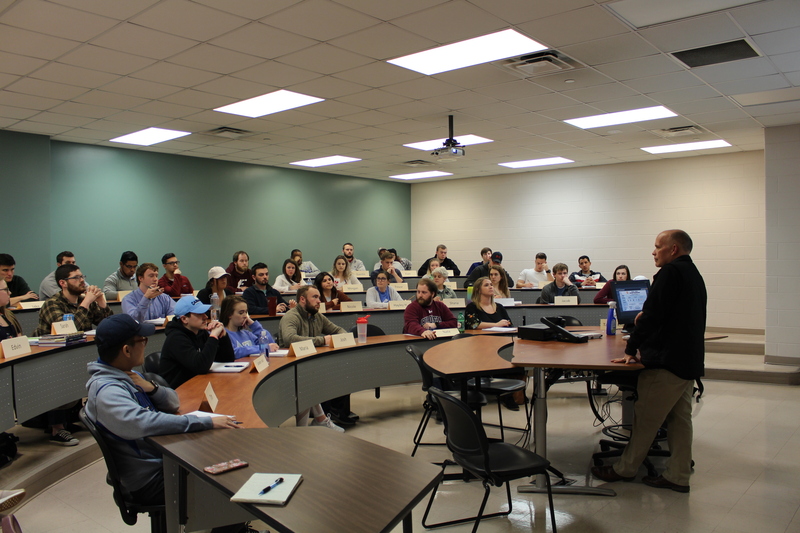 EKU School of Business students were granted yet another opportunity to connect classroom concepts to “real world” scenarios through the knowledge of an executive guest speaker. Mr. Joe Don Long, Director of Quality for Raw Materials at Carhartt joined James Kirby Easterling’s Strategic Procurement (MKT431) and Supply Chain Planning (MGT375) combined classes on Monday, January 28. Mr. Long, with experience in raw materials stretching over 25 years, was able to provide global supply chain students with insight into supply chain strategy and leadership from a global market perspective. Mr. Long began the interactive discussion by better familiarizing students with Carhartt, which started with Hamilton Carhartt and railroad workers in 1889. He impressed upon students the significance of their field of study when he told them that approximately eighty percent of Carhartt’s nearly 6,000 employees are in supply chain. Long discussed with students the process of supply chain, from raw materials until the completed product is in the consumer’s hands. “Our journey is all about our consumers,” Long said, and went on to explain that the brand and its goals must be understood on all levels of the process in order for the company to meet the needs of consumers and turn a profit. Everyone involved must “stay true to that mission, stay focused and on-board,” Long told students. Connection to the Carhartt brand and its goals is key to supply chain strategy and its support of business strategy. Students took advantage of the opportunity to visit with Mr. Long individually after class.